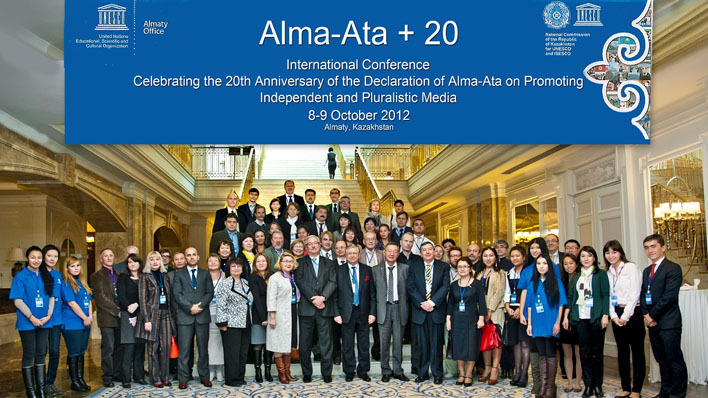 On 8-9 October 2012, the UNESCO Almaty Office organized Alma-Ata+20 – an international conference celebrating the twentieth anniversary of the Declaration of Alma-Ata on Promoting Independent and Pluralistic Asian Media. In reflecting on the past twenty years and looking forward, recommendations for ensuring that a free and independent press grow and flourish in Asia were developed with contributions from the conference participants. The recommendations document is now available. Alma-Ata+20 was organized by the UNESCO Almaty Office in cooperation with the Kazakhstan National Commission for UNESCO and ISESCO. Partners included the al-Farabi Kazakhstan National University and the UN Department of Public Information in the Republic of Kazakhstan. The purpose of the conference was to revive the spirit of the 1992 Seminar on Promoting Independent and Pluralistic Asian Media, recall and give renewed impetus to the outcomes of the seminar outlined in the declaration, and provide a platform for dialogue and sharing good practices on media freedom and pluralism among media specialists twenty years after the original seminar – in a significantly changed media landscape. Over 90 persons attended the conference. Participants included media experts, communication specialists, and representatives of community media, public service broadcasting, universities, training institutes, journalist unions, NGOs related to media development, international organizations (UN, EU, OSCE), and diplomatic missions. Participants were present from Central Asian countries (Kazakhstan, Kyrgyzstan and Tajikistan) with key representatives from other countries, including Australia, Belgium, Finland, France, Namibia, the United Kingdom, and the United States of America. Mr. Sergey Lazarev, Director of the UNESCO Almaty Office, opened the conference on behalf of the Director General of UNESCO Mrs. Irina Bokova. Other opening words were offered by high-level government and institutional officials and UNESCO representatives: Mr. Igor Musalimov, Head of the Almaty Office of the Ministry of Foreign Affairs of the Republic of Kazakhstan; Mr. Serik Seidumanov, Deputy Mayor of Almaty; Mr. Galymkair Mutanov, Rector of al-Farabi Kazakhstan National University; Mr. Janis Karklins, Assistant Director-General for Communication and Information UNESCO, who provided a video message; and Mr. Henrikas Iouchkiavitchious, Advisor to the UNESCO Director-General and Former Assistant Director General for Communication and Information at UNESCO. Mr. Martin Hadlow delivered the keynote speech for the conference. As first Director of the UNESCO Almaty Office, Mr. Hadlow led the organization of the 1992 seminar and preparation of the declaration. Other particularly notable guests included Ms. Gwen Lister, who was co-chair of the first of the series of continental UNESCO seminars promoting the freedom of expression and a free press, which took place in Windhoek, Namibia in 1991 and resulted in the writing of the Declaration of Windhoek on Promoting an Independent and Pluralistic African Press. Through the course of the two-day conference, issues surrounding the following key themes were in focus: legislation and media pluralism; public service broadcasting; community media; gender and media; media pluralism in a digital era; institutional support and media development; and capacity building for journalism education and media professionals. Over 40 experts presented on these themes and engaging discussions took place following each session. As the sessions proceeded, the conference participants offered their ideas for recommendations dealing with the key conference themes. And during the final session, the recommendations gathered were presented and discussed. The conference participants especially noted a vital need for publishing materials (books, magazines, journals, training manuals, etc.) in a range of Asian languages, in order to ensure a more widespread understanding of important legislative, human rights, technological and other related media issues. The participants also particularly asked for the development of a model law on public service broadcasting based on successful experiences from a large number of public service broadcasters. And, in comparison to the 1992 Declaration, more emphasis was made on how gender should be mainstreamed into all issues of media development. While positive experiences were shared during the conference with examples of successful independent media models and structures, media professionals, project personnel and educators too often outlined the major difficulties and constraints placed upon their work by governmental legislative restrictions, political interventions and a lack of resources and training opportunities. The recommendations developed during Alma-Ata+20 drive us to return to the values of the 1992 Declaration, while taking account new issues, such as the digital switchover. Currently in development are the conference proceedings, which expect to include contributions from about 40 conference participants.